The variable xlRange is used outside the if-block. On the other hand R# didn't recognize that the last case label is not used. In this case the VB compiler don't flag an error and correctly calls the Sub Activate(). I'm not sure if VB is too lazy here. for Problem 3 i just added a line to the sample i sent you a few days before. Just found another problem with analyzing COM-Objects. 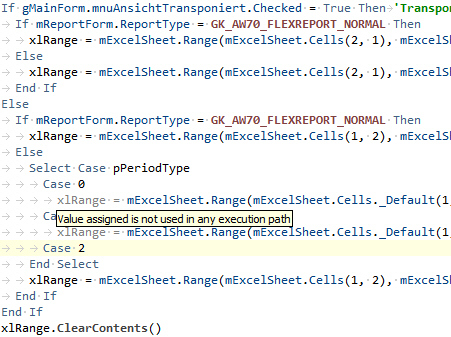 There is a call to an Excel-Function with named parameters in my application and R# flags them as unknown. I have added a line in the sample too. It seems that R# has problems when function return values are of type Object. Just found another problem with XML comments. I have declared an Event and put a comment on it. In the param-tag R# says "Cannot resolve symbol". I have updated my sample solution to demonstrate the problem (See Class1). All problems in this sample are fixed, except for the "Activate" method call. Here VB compiler behavior differs from VB specification, and this requires extra investigations. thanks for the feedback, hope a new EAP build will be published soon because the red error marks in the source always irritating me.